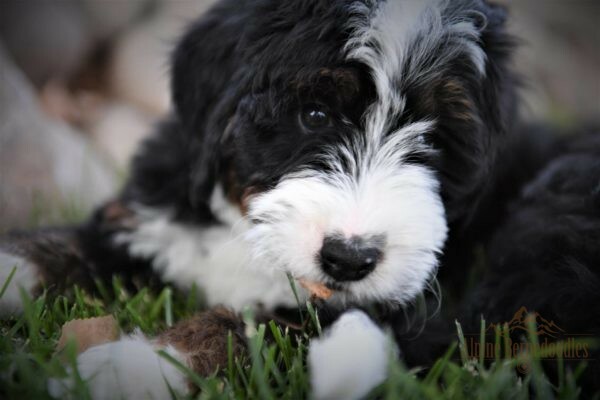 The health of our breeding dogs is the first thing of importance for insuring happy and healthy puppies. Our dogs share our home and live with us as family members on our 12-acre ranch. To expand our breeding program, some of our dogs are in loving guardian homes. This ensures that all of our dogs have a normal family life with love, attention and companionship. Before mothers are due to give birth, they settle into our Nursery Barn. It gives the moms a safe, quiet place away from our other dogs where they can have privacy and stay calm and relaxed. The nursery barn has all the conveniences of home where I stay before, during and after whelping to insure that mom and babies are doing well. The barn is equipped with an apartment, reception area, grooming facility and laundry. The building is fully monitored with cameras for watching from any location as well as security to ensure the safety of our dogs. The nursery is a climate controlled, fully sanitary area where our puppies can thrive and play no matter what the weather. 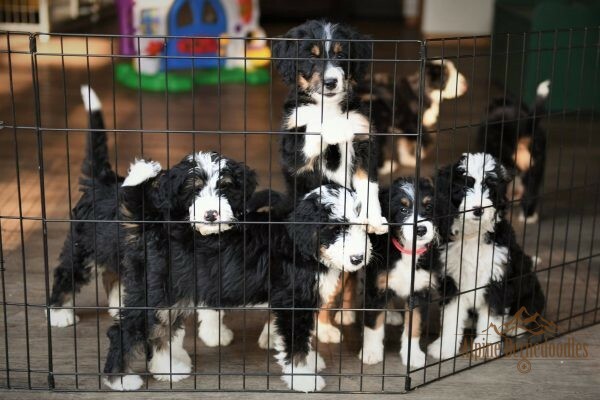 Health is our main priority and the puppy nursery allows us to ensure that our puppies are consistently surrounded by a clean, safe and comfortable environment. The nursery barn includes indoor and outdoor play and training areas as well as a large outdoor play field to run, romp and play so moms can get plenty of exercise in between caring for their babies. Due to health risks to young puppies (ie: Parvo, Distemper, etc.) unknowingly being brought in and momma dogs protectiveness and stress around strangers, the nursery barn is not open to the public. We allow one visit per family on the deposit list prior to pick up. If you would like to see the puppies in person, arrangements must be made in advance. 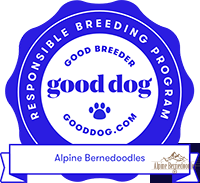 Alpine Bernedoodles is a Licensed breeding facility with the Colorado Department of Agriculture.